S'alright. There's obviously a love of the characters infused through the film, and a couple of the musical numbers are fairly decent. But centering proceedings on new Muppet Walter, a characterless facilitator to express the love that we, the audience, have for the show seems like a mistake. He's dull in conception and has an anodyne story arc (particularly when it comes to his moment on stage). Worse, it's at the expense of the characters we know and love. Instead of hearing how great the Muppets are, we should have seen more of why they're great; there's always something a bit off about showing an audience react to how great we are told a show is and the third act here wallows in that. In the original show Statlor & Waldorf (like most of the cast, very underused) would take the role of putting down the show, not bigging it up as the theatre audience does here. The humans are mostly well-chosen. 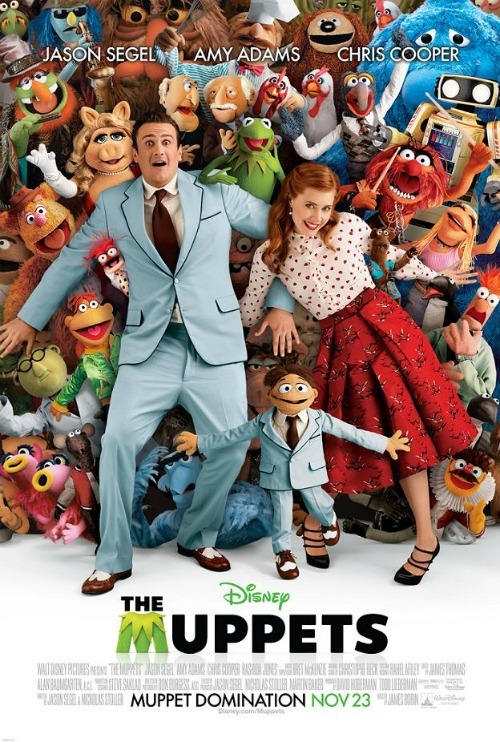 Jason Segel's affable, Amy Adams as gorgeous as ever, and both Chris Cooper and Jack Black (fortunately this is one of his good turns) hit all the right notes in playing off Henson's felt creations. But for their big comeback, the film's surprisingly lacking in big cameos. And lacking in the inspired anarchy of the show at its best. Gonzo has some moments, the Moopets was a good idea (but not as effectively used as it could have been) as was '80s Robot. Maybe it's the constraints of movie plotting, although that didn't stop Christmas Carol being great fun. Watchable, but not a momentous rebirth.